Christmas is known for lots of things: giving, receiving, long-time-no-see faces, egg nog, hot chocolate, and shredding wrapping paper to get to the wonderful gift inside. But who would ever think of Christmas as a time for quiet? Author Deborah Underwood does. In The Christmas Quiet Book, Ms. Underwood reveals all the ways that people—and in the case of this book, forest animals—have been enjoying the quiet of the Christmas holidays without even realizing that’s what they were doing. There’s “snow angel” quiet, “drinking cocoa” quiet, ”Christmas lights on” quiet, “uh-oh, a fuse blew” quiet, and a host of other “quiets” that speak loudly enough to warm any chilly soul. The text in this book is sweet, brief and age-appropriate for the picture book age it targets, yet it is also able to speak volumes to nostalgic adults about the beauty of Christmases past and the promise of warm memories in the future. 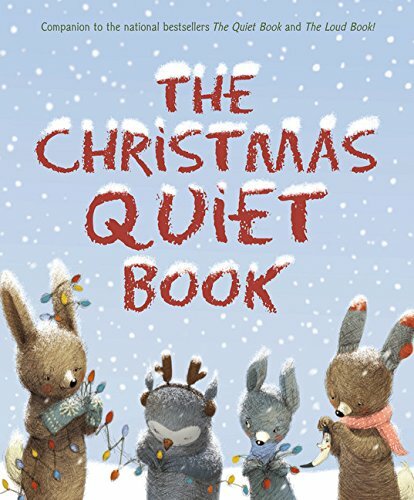 Artist Renata Liwska’s illustrations are the snowy icing on the cake for this “quiet” Christmas book. Among the treasure of snow-laden pictures, there are bunnies making snow angels, owls ice skating, and even fluffy little lambs forgetting their lines in the Christmas play. This heartwarming book is destined to become a Christmas favorite to read just after sunset, when supper is finished, the cocoa is ready, the baby has settled into mama’s lap, the cottony snow has begun to fall, and the last of the beloved out-of-town relatives have taken their places around the crackling fireplace.